I’m all about women supporting other women. I’m also, as you know, a voracious reader. When I have the opportunity to combine both of those things, I’m over the moon with giddyness and delight, so you can imagine how thrilled I am to take part in the cover reveal of a soon-to-be-available novel from a trio of awesome women, one of whom is a colleague of sorts. You see, Dorothy Thompson keeps me in reading material, as her company is one of the two (both women-run) that I receive review copies from. More than that, though, I’m a sucker for a good ghost story, especially at this time of year. As the evenings get cooler (not the days, because I DO live in Texas) and the light gets thinner, I revel in spooky stories. I’m not sure if the walls between the worlds are really thinning, or if my imagination is just becoming more active, but I can’t wait to read the book this cover belongs to! Eccentric tobacco tycoon Rodger Hawthorne III can have anything his heart desires except his dead wife, Sarah. Feeling responsible for the car crash that killed her twenty years earlier, he offers one million dollars to anyone who can find her spirit and bring it to him within one week or the money is forfeited. Six spiritually-challenged—but highly intuitive—women find his ad over the Internet and accept his challenge only to embark on a journey they didn’t quite expect that covers astral traveling, past life regressions and spiritual encounters of the unworldly kind. While this book is lightly based on a true story of a real man who is offering one million dollars to anyone who can prove that spirits exist, this story is purely fictional. Or is it? HEIDE AW KAMINSKI is the mom of three very successful children, and she lives in southeast Michigan with her partner, her son and her stepson. She teaches English in a high school for juvenile delinquent boys, as well as co-directs the Sunday school program for an Interfaith Center. She is also the editor-in-chief for the Interfaith Center’s monthly 16-page newsletter. She is currently the author of five books, ADHD and ME , Get Smart Through Art, The Ability Gang (a novel for upper elementary readers), Von Riesiggross bis Klitzeklein (a German children’s book), and South of Eden (a not so serious novel about life in Heaven). She has also published stories in 15 anthologies, including Chicken Soup for the Divorced Soul. Kaminski was born and raised in Germany, and after spending a year as an exchange student in the USA, she ended up marrying an American and has been a permanent resident in the U.S. since 1984, as well as a citizen of the U.S. since 2007. After dedicating many years to being there for her children first, she obtained her bachelor’s degree in English communications at the ripe age of 50 and her English teaching certificate two years later. PAM RYAN is a writer and professional psychic from Northwestern Ohio. She is the mother of two and has been a widow for the last five years. Her writing career began back in high school where she wrote a column for the Sylvania Sentinel Newspaper in Sylvania, Ohio. Pam was also the first page editor of the high school newspaper as well as doing the public relations for the high school musicals At the University of Toledo she helped to create the Public Relations Department for the Department of Theatre and Speech, worked as a reporter for the college paper, The Collegian, and was assistant to the Public Relation Director of a local Toledo, Ohio, theatre group, Lynro Productions. After college Pam went to work for the United States Government and part of her duties were to write, and publisher a newspaper for the Migrant Opportunity Program in Phoenix, Arizona. Back in Ohio she lent her talents to the local Muscular Dystrophy Association, Make A Wish of Northwestern Ohio, worked on newsletters for Grace Lutheran Church and Christ the King Church, both in Toledo, and did public relations for the Parent Organization of Lake Elementary School. Pamela Ryan, as she is known professionally, began her professional psychic career in 1990. She presently does private readings and parties, and is also available at Lite the Way,Lambertville, Michigan, and The Healing Oasis in Clay Center, Ohio. Pam has recently completed classes and become a Certified Hypnotherapist and has completed the Master’s level for hypnotherapists. Publication is tentatively set for 2013, for her book, “My Dearest Children”, channeled by Mary Magdalene, and is presently working on a biography of world renowned journalist, Ruth Montgomery and a series of books about a fictional psychic medium. The first one is called, “The Macrame Cross”. DOROTHY THOMPSON is the owner/founder of Pump Up Your Book, an innovative public relations firm specializing in online book promotion and social media marketing for authors. Pump Up Your Book was voted #1 in the Preditor’s and Editor’s Readers Poll in 2012. She is also the co-author/compiler of Romancing the Soul, an anthology which proves soul mates exist and has appeared in USA Today, Chicago Times and other publications. Dorothy loves the paranormal and is spatial clairsentient. She lives on the beautiful island of Chincoteague, Virginia. Together, they make the writing team of Romancing the Million $$$ Ghost. Visit the official book blog at www.RomancingMillionDollarGhost.com or like them on Facebook at https://www.facebook.com/RomancingTheMillionDollarGhost. Heide, Pam & Dorothy are giving away these fabulous prizes! One Halloween party kit (valued at $49) or Paypal Cash! Two $25 Amazon Gift Cards or Paypal Cash! One FREE psychic phone reading from one of the authors, Pam Ryan! 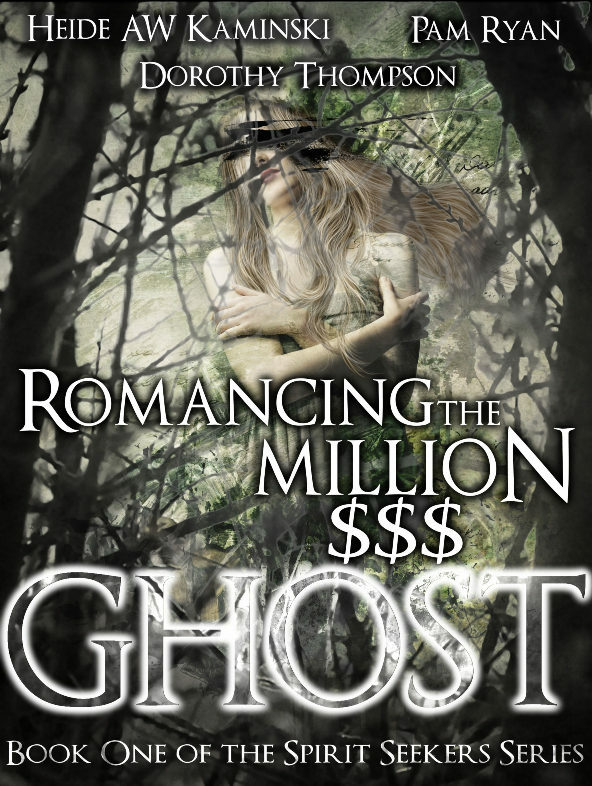 One Romancing the Million $$$ Ghost ebook gifted from Amazon Kindle Store! One winner will be chosen via Rafflecopter to receive a Halloween Party Pack for 18, an eBook copy of Romancing the Million $$$ Ghost gifted via Amazon only, one psychic phone reading from Pam Ryan, and two winners will be chosen to receive $25 Amazon Gift Cards (or Paypal Cash)! This giveaway begins September 2 and ends September 27. Winner will be contacted via email within 48 hours after the giveaway ends at 11:59 p.m. EST September 27 2013. Winner has 24 hours to reply. Each blogger who participates in this promotion is eligible to win. Visit each “stop” daily for more entries. Cover Reveal: Romancing the Million $$$ Ghost by Melissa Bartell is licensed under a Creative Commons Attribution-NonCommercial-ShareAlike 4.0 International License.